Parasurama was the sixth incarnation of Lord Vishnu Parasurama was the fourth son of sage Jamadhagni and Vasugi. The sage was a highly learned person and used to teach vedas and sasthras to a number of desciples. Those days young princes and children of humble parents used to stay together without any distinction with the master. Parasurama was one of the disciples and was extremely obedient to his father besides being a very diligent student. earthern pot and fetch water for the family.One day as she was making the pot a 'gandharva' ( celestial beings)passed over-head in the sky. She saw the reflection of the gandharva in the river water and was struck by the hand some features just for a moment. That wavering of the mind was considered being untrue to her husband. As a result that day however much she tried she could not make the pot. It broke every time she shaped it. Vasugi was unnerved by this and was afraid to go home. Sage Jamadhagni sensed this through his mental power sand became incensed that his wife admired the beauty of some one other than her husband. Wanting to punish her he ordered Parasurama to behead his mother. Being an obedient son he immediately carried out his father's order. 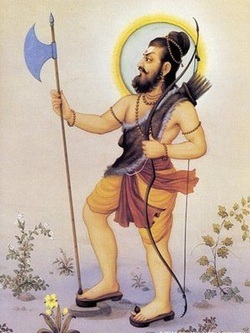 However Parasurama was overcome with great grief and also feltvery angry towards his father. He developed a cruel nature though he remained a sage all his life.